It May be Purim, But I Ain’t Jokin’! 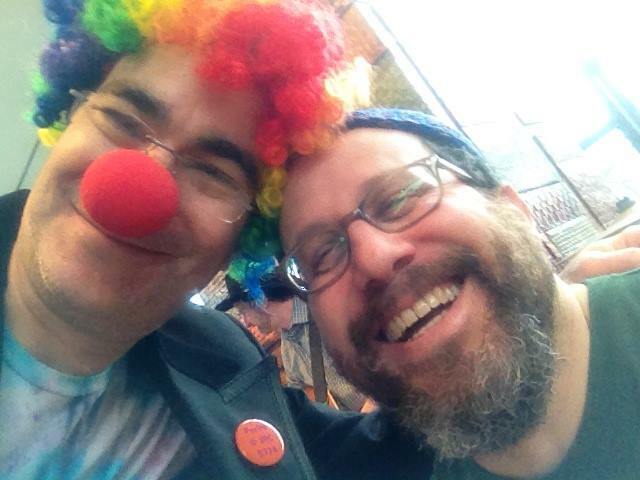 Me with my dear friend and Rabbi, Brant Rosen. He’s such a clown! Sorry you can’t see my Queen Esther skirt! Purim is a great time for playing around and having fun. Heck, there might even be some pictures out there of me dressed as Queen Esther! Nevertheless, I am quite serious when I say that tomorrow night we’ll complete the process for phase 2 of recording Shabbat Sweet when we add the harmony vocals to V’Shamru and Adon Olam. Then it will be on to mixing that set of four prayers. THEN… we’ll start recording the last four: 1) Beggar’s Niggun, 2) Amidah, 3)Shalom Rav and 4) Hashkivenu. I know, I know: for those of you who have experienced Shabbat Sweet live, you may be thinking, hey, aren’t there other prayers that won’t be included in the recording? And, sadly, that is true. Heck, I even wrote a new melody of Ahavat Olam this past year!!! The reality is we’ll record everything that the generosity of the amazing Kickstarter backers will allow. I am extremely proud of what we’ve done, and I’m sure the same will be said of what we’ll do. And it’s been a costly adventure to make such a recording of this high quality. I’m sure we’ll get the rest of the Sweet recorded with the next album!!!! Previous PostShabbat Shalom, and What a Couple of Days We Have Ahead! !Next PostThe Kickstarter Campaign was a Year Ago?